The walk from Waterloo station to The Imperial War Museum is one of London’s dreariest, second only to any perambulation taking in Lower Thames Street. The sour smell of Lambeth’s bins is punctuated by blasts of hot beery air as the pubs throw open their doors on a muggy July morning. I am here to see a collection of World War I paintings gathered under the heading ‘Truth and Memory’ as well as the re-vamped atrium. The atrium proves to be a sombre affair, the fixtures and fittings are cold, gunmetal grey. The exhibits are also grey and forbidding with a grim looking Harrier suspended above you and no sign of a bi-plane anywhere. The vibe is subdued and solemn whereas I recall as a boy getting goose bumps at the sight of all the weaponry. Perhaps this is a result of growing up, but I suspect it is more that our attitude to conflict has shifted dramatically away from the way it was depicted in Commando or Battle comics. Realism is king here and also rears its head in the temporary exhibition of British First World War art. Filippo Marinetti, founder of the Futurist movement, once declared that he and his cohorts would ‘glorify war – the world’s only hygiene’. He certainly wouldn’t like the new atrium and I would question whether dabblers in futurism, Christopher Nevinson or Paul Nash, had any intention of celebrating the war. 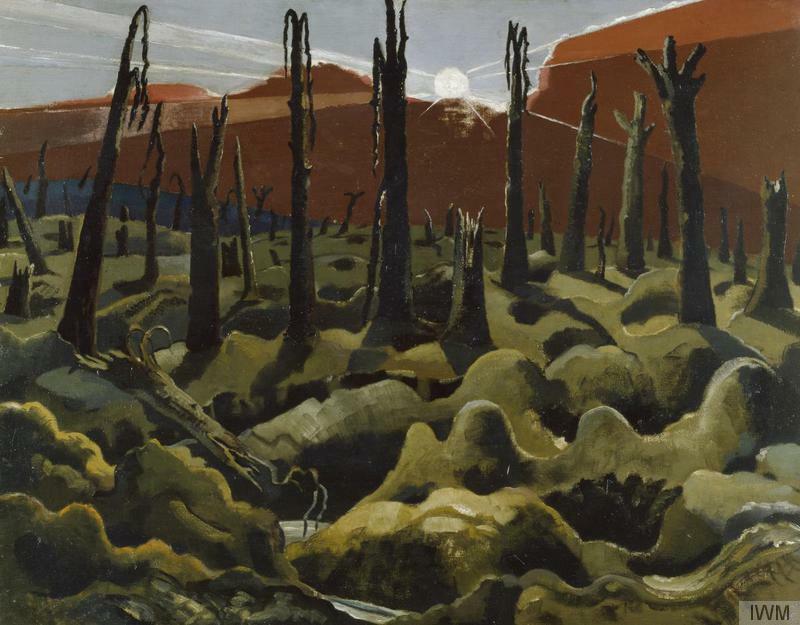 Their work is represented by several striking pictures, Nash’s The Ypres Salient at Night with its jagged trench illuminated by strobes from a flare has a frosty brilliance. Both men served in the war and both drifted towards realism, perhaps the only way they could express horrific scenes they had witnessed. Nevinson’s Paths of Glory shows two dead Tommies, face down in the mud of no-man’s land. One is left in no doubt that this miserable little scene is a squalid consequence of war and is deeply sobering. The descriptions that accompany each painting are particularly well written and informative. I learned that Paths of Glory was unsurprisingly censored, but Nevinson exhibited it anyway, partially obscured by brown paper across the bodies reading ‘censored’. The title later became a book before Stanley Kubrick filmed it; a withering satire on the folly of war. The show does include the ludicrous Defeat of The Prussian Guard, Ypres, 1914 by W. B. Wollen. This is the Brits sticking it to the Hun in an heroic charge. Plucky us against the stiff militarists in spiky helmets. I actually quite like it as it could have nestled happily in the pages of Commando. Walter Sickert makes a surprise appearance, taking time off from painting prostitutes in Camden. Again, I learned he skulked off to live in Devon, evidently not impressed by the Zeppelin air-raids. Chief windbag of the Vorticists, Wyndam Lewis, is here with A Battery Shelled as well as the artist he spent some time mocking, William Orpen. Orpen was too much of a realist for Lewis although his portraits of fighter pilots looking moody and heroic would certainly have been morale boosting stuff. 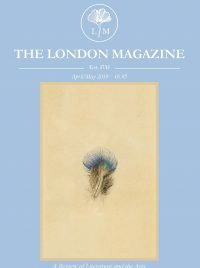 World War I coincided with some radical artistic techniques and manifestos. Take someone along who isn’t interested in ‘war’ and watch as they are ensnared by this fascinating collection of paintings. The museum was horribly busy when I visited but the show is fairly quiet. I negotiated the miserable walk to the station with a head full of startling images and barely noticed the smell, despite the fried chicken joints firing up their fryers. ‘Truth and Memory’ is on until March next year. The museum is open 10 am – 6 pm.